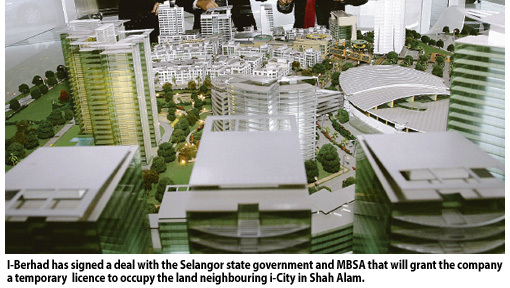 SHAH ALAM: I-Berhad, an integrated information, communications and technology-based developer, expects the gross development value (GDV) of its Shah Alam iconic property development, i-City, to swell to RM3 billion, with the acquisition of additional 12ha of land from the Selangor state government. The company signed a management and development agreement with the state government and Shah Alam City Council (MBSA) yesterday. The agreement will position i-City, also known as "City of Digital Lights", as the world stage for international investors, tourists and events. I-Berhad chief executive officer Datuk Eu Hong Chew said under the agreement, the state will grant i-City a temporary occupation licence for the 12ha of the neighbouring land so that it can be landscaped as well as used as a car park. "Secondly, from a development perspective, the plot ratio in i-City can be increased from 1:3 currently to 1:5. "Thus, the increase in the plot ratio will mean the GDV of i-City can now be increased from RM2 billion to RM3 billion," he told Business Times on the sidelines of the signing of the agreement, witnessed by Selangor Menteri Besar Tan Sri Abdul Khalid Ibrahim. At the signing, the state government was represented by State Secretary Datuk Mohammed Khusrin Munawi and MBSA by Shah Alam Mayor Datuk Mohd Jaafar Mohd Atan, while Eu signed on behalf of i-City. Eu said the agreement is in line with the state government's vision for i-City to be the catalyst in making Shah Alam an international city to attract both knowledge workers as well as tourists. "i-City has already been certified as a MSC (Multimedia Super Corridor) Malaysia Cybercentre by the Science, Technology and Innovation Ministry and endorsed by the Tourism Ministry. The agreement signed today (yesterday) builds on top of these certifications," he said. Under the agreement, i-City would be permitted to manage the whole 28.8ha land as a gated and guarded zone. On the progress of i-City, Eu said with the additional acreage, the company expects to complete the iconic property development within 15 to 20 years, from 10 years initially. Well received: Choo (left) showing the scaled-down version of the Starz Valley. Tagged with a glamourous name, interested house buyers are flocking to see the newly launched Starz Valley project in Nilai. 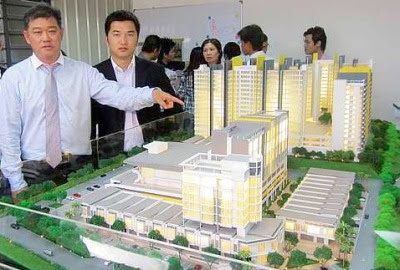 The freehold mixed development by Golden Plateau Sdn Bhd may be the company’s debut project but has sold out its commercial units in just a day. All 38 units of its shoplots priced between RM600,000 and RM1.1mil each were snapped up during its launch and 104 units of Soho offices were sold out within a month. Located oppposite Inti International University, the project encompasses commercial lots, a five-storey boutique hotel, a sports centre and four blocks of serviced apartments. Company managing director Y.C. Choo said the strategic location of the project coupled with its modern design were among the main selling points for the development. “Before embarking on the project, we conducted a detailed survey on the properties here and designed our project to meet actual demand. “Our strategy must be working judging from the overwhelming response,” he said. The four blocks of 13-storey serviced apartments will house 1,111 units with the smallest unit (studio) measuring 290sq ft and the largest (three-room) measuring 1,018sq ft. The apartments are priced between RM109,000 and RM320,000 for the first block. The serviced apartments which will have a community hall, swimming pool and gym are equipped with security features including a panic button in each unit and touch card for the elevators going up to the residential floors. The apartments also come semi-furnished with wardrobes, air-conditioning units and kitchen cabinets. The project, which will begin construction soon, is scheduled to be completed in the next three years. Choo said the first phase of the project will be ready by the end of 2013.